Did you know old “Scarface” Capone had an impact on the Chicago’s African American community? What does Alcatraz have to do with Harlem’s most famous godfather? Why is Denzel Washington in this book? Who is a modern day desperado who died by the gun but managed to live on through rap music? How did a stick-up artist from Brooklyn become Hip-Hop’s Answer to Lee Harvey Oswald? Each of the following stories may be amazing, but all of them are true. Straight from the hood. SKU: 9780984233335. Category: True Crime. Tags: black gangster, gangland, godfather, Harlem, hip hop, kingpins, rap music. Many books have written about the black gangster. They have been, for the most part, lengthy tomes focusing on the kingpins of the gangland scene, gangsters with names like Nicky Barnes, Frank Lucas, Lorenzo Fat Cat Nichols and Kenneth Supreme McGiff. Yet there are many stories about the black gangsta that have not received much press coverage or have simply been ignored or missed by the media. They indeed reveal a lot about the history of the hood. 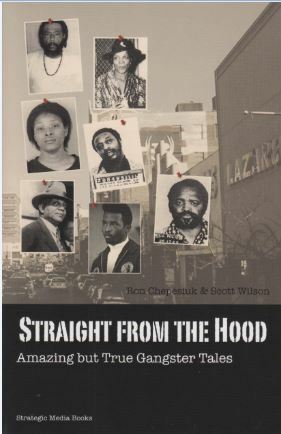 Straight from Hood is a compilation of some of those fascinating stories. In Straight from the Hood, you will find tales feature drug kingpins, entertainers, hit men, street gangs, con men, corrupt cops and reformed gang bangers. Read about the most feared man in the entertainment industry, the love story between Fran, a former heroin addict, and David, a reformed gangsta, both of whom have become celebrities; the unlikely alliance between an ambitious Black gangsta and a violent-indeed crazy-white Italian-American mobster; the terrorist plot involving a Chicago street gang, and more. Did you know old “Scarface” Capone had an impact on the Chicago’s African American community? What does Alcatraz have to do with Harlem’s most famous godfather? Why is Denzel Washington in this book? Who is a modern day desperado who died by the gun but managed to live on through rap music? How did a stick-up artist from Brooklyn become Hip-Hop’s Answer to Lee Harvey Oswald? Each of the following stories may be amazing, but all of them are true. Straight from the hood. They have been gathered for your reading pleasure to inform, educate and enlighten you. You will certainly be entertained by Straight from the Hood. Nothing like it before. Nothing like it since. Murder Inc. was the most unusual, brutal and extensive collection of characters the American underworld had ever produced. Culled primarily from Brooklyn’s Brownsville and Ocean Hill sections, these official on-call killers of New York’s larger crime Syndicate were a unified force of Jewish and Italian gangsters that treated murder as an art form for an entire decade. In this page-turning narrative, noted true crime writer Ron Chepesiuk chronicles the story of one of history’s lesser known but most important mob dynasties. 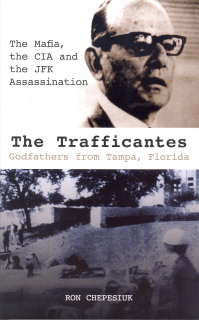 For nearly seven decades, Santo Trafficante, Sr. and his son, Santo, Jr. were prominent gangsters on the Tampa crime scene. Santo, Sr. arrived in Tampa in 1902 and settled in the Ybor City area where he slowly began his climb to the top of the Tampa mob scene.